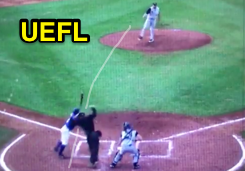 Saturday's West Virginia vs Middle Tennessee State University took an odd turn when a pitcher working on an early no-hitter was ejected, nearly hitting the contest's home plate umpire after time was called prior to a pitch. In the bottom of the fourth inning, West Virginia Mountaineers starting pitcher Alec Manoah faced Middle Tennessee Blue Raiders batter Ryan Kemp. As Manoah prepared to begin his 0-2 delivery, out of Windup Position, batter Kemp requested "Time," which was granted by plate umpire Phil Cundall as Manoah continued through his delivery, ultimately releasing the ball and nearly hitting both batter and umpire with the "no pitch," resulting in his ejection from the contest in the midst of a shutout and no-hitter. Replays indicate that while right-handed batter Kemp requested "Time" prior to Manoah beginning his windup, the umpire's "Time" call ran simultaneous with Manoah's motion; Manoah followed through with his delivery, and threw the ball through the right-handed batter's box, causing both Kemp and HP Umpire Cundall to jump in an attempt avoid the ball. Conflict and Game Management: After the ball ran to the backstop, Kemp appeared to take several steps toward the mound before Cundall stepped in front of Kemp and ejected Manoah, who himself had taken several steps off the mound and toward Kemp and Cundall's position up the third base foul line. Had Kemp remained in the batter's box after the "Time" call, the pitch may well have hit him. Did UIC Cundall prevent a fight? Coach/Player/Umpire Philosophy is an NCAA point of emphasis for the 2017 and 2018 seasons, as the NCAA committee "continues to be concerned about unsportsmanlike conduct and the number of ejections that occur during the season." Furthermore, "of particular concern are increasing reports of players making disrespectful comments to umpires." For observers unsure if Manoah threw at Kemp or Cundall, penalties for intentionally throwing at a batter and an umpire are remarkably similar: as long as the action is deemed unsporting and not an "accident," the rule book requires repercussion. 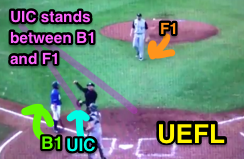 If one subscribes to the notion that pitcher Manoah threw at the plate umpire to dispute the "Time" call, NCAA Rule 2-26-e states, "Whenever a pitcher is ejected for disputing an umpire’s decision or for unsportsmanlike conduct toward an umpire, whether while serving as the current game pitcher or after having been removed from the game that is still in progress, or in a game that has concluded and the ejection is post-participation, the suspension will be for a total of four games." If one subscribes to the notion that Manoah instead aimed at batter Kemp, Rule 5-16-d governs: "If a pitcher is ejected for intentionally throwing at a batter, the following penalties shall be enforced...For the first offense by the individual, ejection plus suspension from the team’s next four regularly scheduled contests." Important Note: The ejection is for "intentionally throwing at a batter," not for "pitching at a batter." In other words, it needn't be an official pitch for an ejection to be effected; just a throw.